Your cell phone, much like your computer, holds a considerable amount of sensitive personal information. As such, it is of little surprise that law enforcement officials often have a desire to access this information. However, you have every right to keep your phone, its contents, and you personal privacy protected. Florida police officers do not have the right to look at your cell phone. 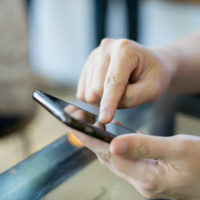 Here, our Tampa criminal defense attorneys explain what you need to know about the police when it comes to a search of your cell phone. The Fourth Amendment to the United States Constitution protects individuals against unreasonable government search and seizures. This protection extends to everything from your home and your vehicle to your cell phone and your laptop. As a general rule, law enforcement officials can only look at yourself if they obtain: your consent or via a search warrant from a judge based upon a sworn affidavit setting forth probable cause. There are some circumstances where police may search phones based upon probable cause – as set forth below. You should be aware of the following important fact: Police officers will often simply ask you if they can perform a search. They may ask you if they can search your vehicle, your person, or even your cell phone. Further, they are likely to neglect to tell you that you have a right to say ‘no’. If you find yourself in this situation (or any situation where a police officer is requesting your permission to search your person, vehicle, or home) do not consent to a search. If you consent, then their search is almost certainly legal. Your best course of action is to protect your rights and decline a voluntary search. Make law enforcement officers provide good cause to a judge and get a warrant before going through your cell phone. What constitutes a legitimate exception in any given situations can be hotly disputed. So, what happens if a police officer tells you that they have probable cause and they decide to conduct a search without a warrant? If a Florida police officer conducts a search of your cell phone without a warrant and without your consent, you need to contact an experienced attorney immediately. Do not fight back or physically resist a search. This is a legal issue and you need to get help from an attorney. The officer may have violated your legal rights. If you were charged with a crime based on evidence obtained from the (possibly) illegal search, your attorney may be able to get that unlawfully obtained evidence excluded from your case. If you are facing criminal charges in Florida, you need to act now. Please do not delay in calling our Tampa office today at (813) 242-4404. Initial legal consultations are always free of charge. At Pawlowski//Mastrilli Law Group we serve clients along Florida’s Gulf Coast, including in Clearwater, Largo, Tarpon Springs and Dunedin.